Back in 2008, out of desperation, I started using a cookbook called “Deceptively Delicious” in order to get my kids to eat their vegetables. Have you seen this cookbook? It was written by Jerry Seinfeld’s wife, Jessica. It was all the rage and I joined in on the fun. Basically you cook, puree, and then freeze various vegetables in zip-lock bags. Then you pull them out and add them to the recipes in her cookbook. Well I did this for a few weeks and it was hilarious…we had brownies with spinach and the kids actually liked them and had no idea (not sure if they noticed the slightly green tint)! I made these tortilla “cigars” with yellow squash and carrot puree, mashed potatoes with cauliflower puree and macaroni and cheese with butternut squash. It was extra work, but I liked knowing they were getting their vegetables, even if they weren’t aware! Well, one night after consuming one of these meals with yellow squash and cauliflower puree, my family all got stomach aches and major gas! I felt so bad that I decided NOT to sneak around anymore. From now on, I would serve up those veggies in their full glory…no more hiding! Plus, I wanted to teach them to enjoy vegetables, knowing what they were eating! This is when I created my own version of Pasta Primavera. Loaded with vegetables and just enough parmesan cheese, they actually liked it! I do notice, however, there are always a lot of extra veggies in the pan! Hmm, I wonder what this means? 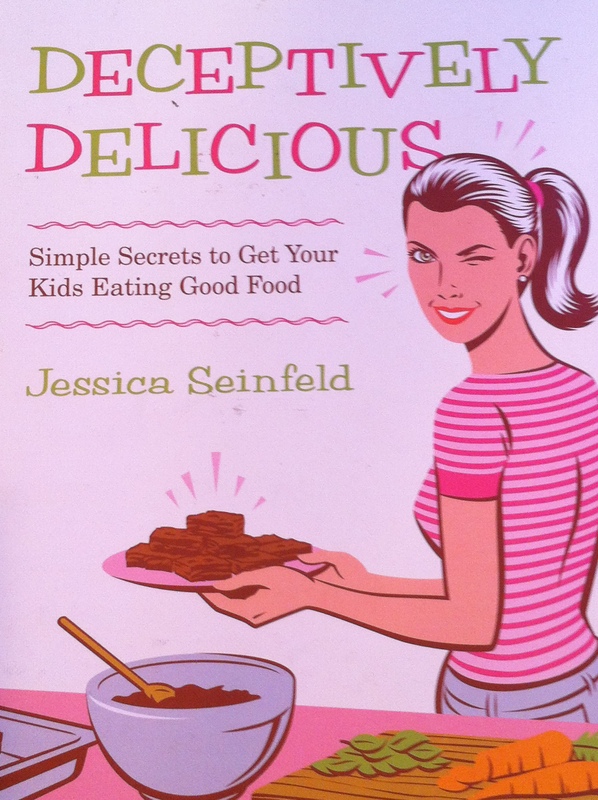 Postscript: Jessica Seinfeld’s cookbook is pretty funny and has a lot of great ideas for kids and healthy eating. Bring a large pot of water to boil. When it reaches a rolling boil, add pasta and cook according to package directions. Prepare all vegetables and set aside. Add oil to a skillet and heat until melted. Add carrots and celery; sauté for 5 minutes. 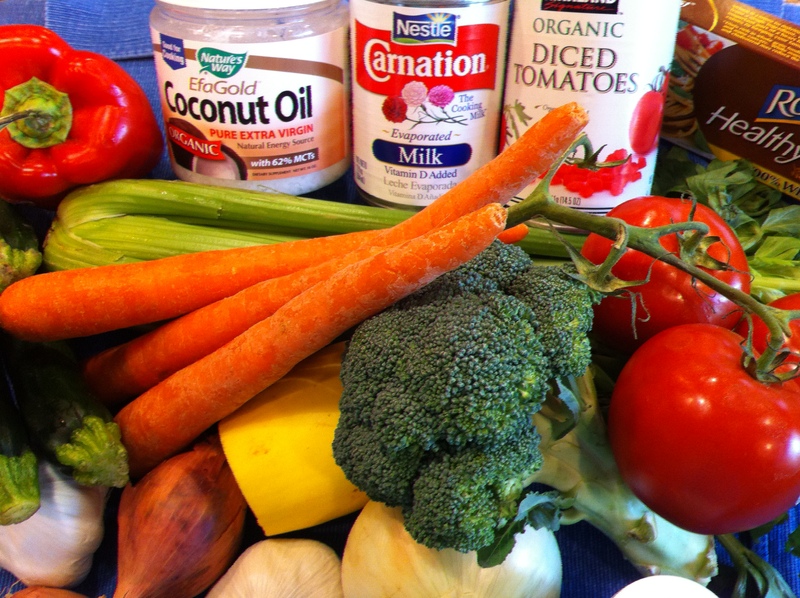 Add onion, garlic, bell pepper, zucchini and broccoli or any other veggies that you have on hand. Sauté for another 5-10 minutes until vegetables are tender. Add herbs, seasonings, chopped tomatoes, fresh basil and evaporated milk. Add pasta and cheese; stir to combine. Continue to heat until milk thickens and is absorbed by the pasta. Serve and enjoy! that cook book reminds me a ton of those spinach brownies! Mom! I totally made carrot and spinach brownies the other day….and I thought of you!! Kurt was soo excited when he got home and smelled them. Then he took one bite and had a look of distress on his face….”What did you put in these? !” Apparently they tasted “earthy”. James loved them though! He ate most of the pan himself!! 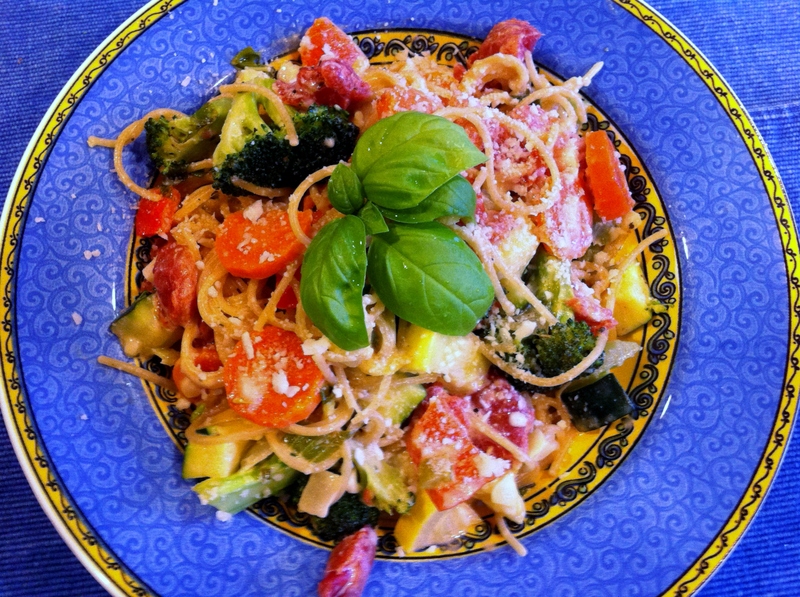 And this pasta sounds incredible…can’t wait to make it!!! Fresh veggies, here we come!!! Liz, I LOVE your food blog!! I share your love of cooking and trying new healthy recipes. I look forward to trying yours. Wish me luck on getting my kids to eat the veggies!